Featuring a balcony South Lake Tahoe Multi-Level House South Lake Tahoe is a holiday home located in South Lake Tahoe 2.9 km from Heavenly Ski Resort. The holiday home is 4.2 km from South Tahoe Ice Arena. There is a dining area and a kitchen as well as a private bathroom. A flat-screen TV is featured. Other facilities at South Lake Tahoe Multi-Level House South Lake Tahoe include a fitness centre. Tahoe Queen is 5 km from South Lake Tahoe Multi-Level House South Lake Tahoe while Washoe Meadows State Park is 7 km away. 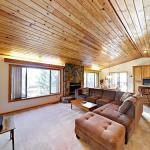 The nearest airport is Reno-Tahoe International Airport 69 km from the property.